Preheat the oven 180°C/350°F/Gas Mark 4/Fan 170°C. Cut the peppers in half, lengthways and remove the seeds and any core fibres. In a bowl combine 90g of the Double Gloucester grated cheese with the remaining ingredients. 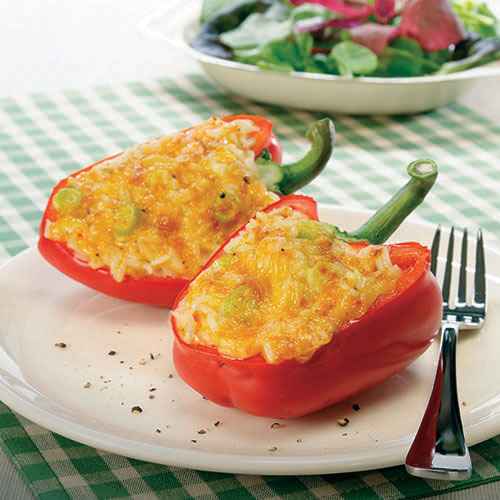 Fill the peppers with the cheese mixture and place on a deep baking tray or ovenproof dish. Sprinkle the remaining cheese over the stuffed peppers. Cover the tray/dish with foil and place in the centre of the preheated oven and bake for 20 minutes. After 20 minutes remove the foil and bake for a further 15 minutes, or until the peppers are tender and the filling is golden brown. Serve immediately with a crisp mixed salad. Tip: If the peppers roll on the baking tray, line it with scrunched up foil which you have formed into Small wells, this will stop them moving and save you washing up!